So, this living off the grid thing? I find myself less inclined to look recipes up as often as I used to. I spend much less time at my iMac and way more time on my iPad because the iPad requires much less power to operate. But today the sun is shining and the wind is blowing so our batts are charging and I am living large having both my iMac and my iPad going at the same time! Shocker, I know! I had half a can of refried beans that needed using up; also had some flour tortillas hanging out in the cold room; oh, and a heavenly head of romaine lettuce! Set the brain to churning what to make with those ingredients? Quesadillas; have the tortillas, cheddar cheese, a tomato, green pepper and 4 green onions to go with the refried beans. Now, a Mexican flavoured dressing. Thanks Google! At Mel’s Kitchen I found what I was looking for: Cilantro-Lime Vinaigrette. Do I wish I had all the fresh veg to put together her Chopped Salad? You betcha! 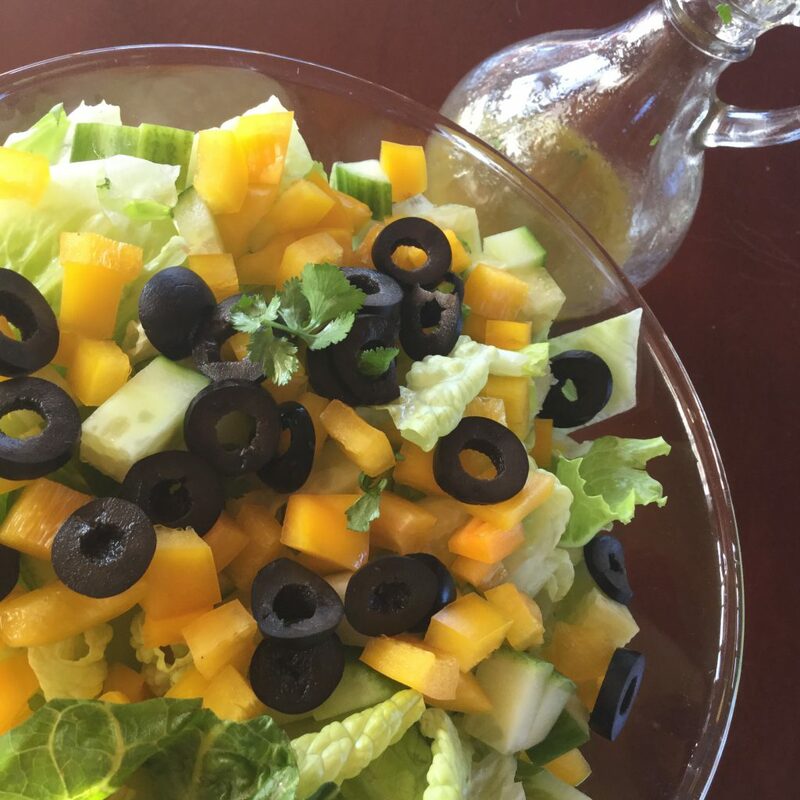 As it is, I used what I had in my cold room: that lovely Romaine, some black olives (note to self: remember to buy SLICED black olives) a yellow pepper, 1/3 of a long english cucumber. Do I have fresh limes on hand? Nope, but I do have lime juice so that had to do. In small jar with a lid combine all the vinaigrette ingredients and shake until well combined. Add additional S&P, to taste. Pour dressing over salad, toss; serve immediately. So having moved off-grid is challenging how I do kitchen stuff. For one, I am meant to only go grocery shopping once every 2 months or so. Now, as a Vegetarian? That’s a lot of produce to purchase! And you can well imagine that there is no way that much produce is going to keep that long even if I DO store it in Tupperware Fridge Smart containers! I have planted garden greens and stuff in my greenhouse but that was only 3 weeks ago so I am not able to enjoy its bounties just yet. Anyway, one of the produce purchases I made was 4 LE Cucumbers. Now if the weather was nice and cold up here like it’s supposed to be then maybe the cukes would have lasted longer but it ISN’T cold so now I have to find ways to use up all my precious produce! Another tricky thing? My husband doesn’t really like cucumbers! I love ’em but there are only so many cukes a girl can eat! Well, thankfully I still have internet access out here in the middle of no where; I googled cucumber recipes and found this one over at Two Peas & their Pod(s) whom I have been following for years so always trust their recipes! Oh, I suppose I should have mentioned that we use a cold room and not a fridge in the winter to conserve propane. Hence my lamentations that the weather is not all that cold here at the mo. If I am to believe this thermostat, it is a balmy 10C outside!!!! What?? We are high up in the Chilcotin region of British Columbia and it is supposed to be COLD here. I digress. I was pleased to find their Asian Cucumber Salad. And much to my delight, Luke loved it. He even said, “Hey, there’s ginger in here, right?” Now normally he is like Emile in Ratatouille and eats any and everything without a lot of regard to what goes into a recipe so I was impressed. Right, the recipe! Please do go over and visit The Two Peas! They have a great site and some GREAT recipes! Place sliced cucumbers in a small bowl and sprinkle with salt; set aside. In a small bowl whisk together the rice wine vinegar, sugar, sesame oil, cilantro, green onions, garlic and ginger; drizzle over cucumbers. Sprinkle salad with sesame seeds and red pepper flakes, to taste.